When talking with living legends in the blues or rock idiom, you're bound to encounter some change-up in the lineup. Somebody comes; somebody goes. It's kind of like fantasy football, except cool. Original lineups just don't always weather the storm that comes from being in a band. 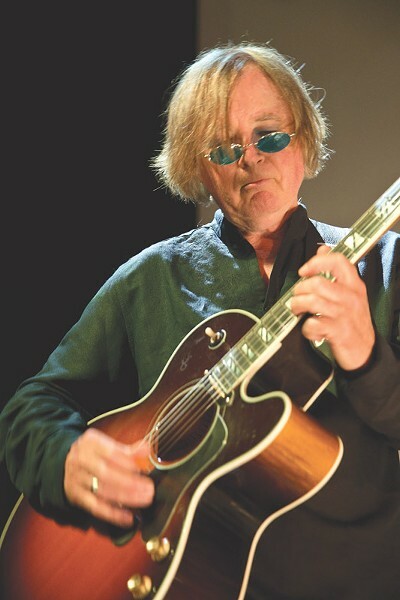 Legendary guitarist of the British blues Kim Simmonds is the sole original member left in Savoy Brown, the seminal blues rock outfit that was formed in London in 1965. But we're not talking about a drummer here, or a bass player there. Savoy Brown has had more than 60 musicians pass through its illustrious ranks. Some attribute this to the band never hitting the big time, especially in the United States — although the band charted here consistently throughout its 50-year history with damn near 50 records to its credit. Some folks, including Simmonds himself, think those changes have kept the band fresh and accessible over the years. Simmonds is currently on the road — solo this time around — and playing the blues he and other English progenitors like Clapton, Moore, and Mayall helped nurture and preserve, while creating their own angle on its boogie in the process. CITY shot some questions at Simmonds, and he fired some answers back. An edited transcript follows. CITY: What can you do playing solo that you can't do with the band? Kim Simmonds: I can be on my own. Simple as that. It's a one-man show. And I've always been an individualist, so playing solo gives me a platform to be just that. It's easier to play with the band because I've done that since I was a mid-teenager. It's harder to play a one-man show. I like doing the latter because, on stage, it never goes to plan. You have to think on one's feet. How did you discover the blues? I had an older brother who was a musical mentor to me. I listened to the records he bought starting with Johnny Ray in the early-50's. Then it was rock 'n' roll, then rhythm and blues, then it was jazz, and then finally blues. I decided to focus on the Chicago blues style as a teenager. That style turned out to be the basis of a lot of modern guitar playing. I think I got my first guitar at 13 years of age, a cheap acoustic. I quickly changed to electric. Friends at school said I was good, so that boosted my confidence. Who were some of your guitar heroes and why? Freddy King. I played a song of his on the first album in '67. He really had tons of energy when he played, and that appealed to me. Billy Butler, Bill Doggett's guitarist. I played one of his songs on the first single releases in '66. He was a jazz/blues player and I've always liked bluesy jazz. Do you think the frequent lineup changes helped keep the sound fresh? That's exactly what happened. It helped the band evolve over the years ... at first it was perceived as a negative ... but I think, now, it looks like I was ahead of the times. What is something you still do after all these years? I still practice guitar every day. If you don't keep finding it, you lose it. What is something you don't do anymore? As you get older, most of us drop our indulgent habits ... mostly because we have to. Nowadays, I live like a monk. How is your classic material received by this new generation of fans? I see younger people in the audience. I think they hear the classic material as such. The perceptive ones know how important Savoy Brown was in forming the British blues sound. How do die hard Savoy Brown fans take to the new material? I play lots of new material and the audience doesn't blink an eye. They tell me it seamlessly fits with the old sound. It's exciting when you can still play blues/rock, as it was decades ago, but with a modern edge.